Box Text: Is it real… or only in your head? Prepare for an epic psychological thriller where nothing is at it seems. As you delve deeper into the dark designs of an ancient evil, you’ll have to fight to save your characters’ sanity… and your own. • Control a host of chosen souls destined to battle against unspeakable terrors in an adventure that spans millenia. • Fend off madness as the epic tale unfolds ─ unique sanity effects blur the line between fantasy and reality. • Using the Tome of Eternal Darkness, unravel the secrets that bind Alex Roivas to an undying evil. • Master arcane magick and craft your own spells to light your way through the darkness. • Battle against grisly fiends with authentic weaponry both ancient and modern. 01-28-2019 silverbow Box Text Is it real… or only in your head? Prepare for an epic psychological thriller where nothing is at it seems. As you delve deeper into the dark designs of an ancient evil, you’ll have to fight to save your characters’ sanity… and your own. • Control a host of chosen souls destined to battle against unspeakable terrors in an adventure that spans millenia. • Fend off madness as the epic tale unfolds ? unique sanity effects blur the line between fantasy and reality. • Using the Tome of Eternal Darkness, unravel the secrets that bind Alex Roivas to an undying evil. • Master arcane magick and craft your own spells to light your way through the darkness. • Battle against grisly fiends with authentic weaponry both ancient and modern. 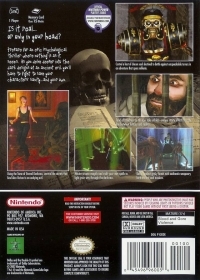 This is a list of VGCollect users who have Eternal Darkness: Sanity's Requiem in their Collection. 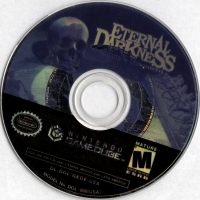 This is a list of VGCollect users who have Eternal Darkness: Sanity's Requiem in their Sell List. 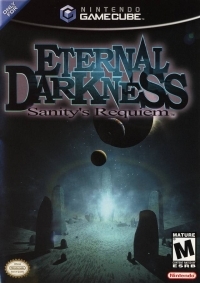 This is a list of VGCollect users who have Eternal Darkness: Sanity's Requiem in their Wish List.